Doing it Better is about more than just providing good service to our customers. It's also about doing good and serving our communities. And because we want to help support the things you care about, we've created the Burt Brothers Tire & Service Ultimate Fundraiser Card. With it, there's no limit to the amount of money you can raise for your team, school, or group! Fill out our easy form below and we will contact you. 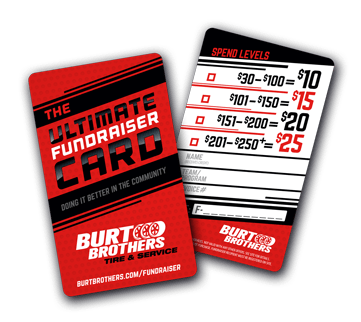 Pick up your Ultimate Fundraiser Cards from any of our Burt Brothers location. Pass them out to your friends, family, and neighbors. Every time they spend money in our stores, you are earning money towards your fundraiser. We track your funds and cut your check at the end of your fundraiser program. Start today and let's do it better for your team and our community!